The year was 1981, I was eleven and we had just moved from London to a sleepy village in Somerset. Compared to growing up in west London with its adventure playgrounds and video arcades, the pace of life was somewhat calmer. We lived across the road from the village Post Office which, in 1981, was the only source of comics and sweets within walking distance for an eleven year old. So needless to say Saturday mornings involved getting up, eating breakfast, gaining pocket money and then a quick walk across the road to spend, spend, spend. I would sometimes see Keith, the postmaster, doing paperwork out at the back of the shop and on one occasion noticed he was typing onto a small black thing. I must have known (somehow) about computers and what they were, probably from old friends back in London who had Atari 2600 video games systems, but had never seen a real computer in the flesh. 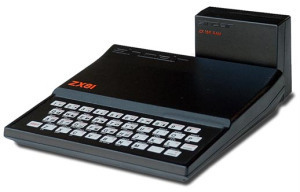 After a few lessons Keith allowed me to take the computer (a Sinclair ZX81) back across the road to my house, where, every Saturday I would diligently type in a program from the back pages of the Sinclair magazine or even write a few of my own. It was then that I learned an important lesson in programming – the “Syntax Error”. After college I and few mates joined The Somerset ITec (Information Technology Centre) in Taunton, which was basically a glorified YTS scheme for nerds. We learned about applied business computing – word processing, databases, spreadsheets and the like. But for me the real enjoyment came from programming and playing around with Modems, newsgroups and BBS (bulletin board systems). While I was at the ITec I turned down a job as a “Data Librarian” for the Burton Group (now Arcadia) not because the idea of looking after rooms full of magnetic tape didn’t thrill me (yawn) but, mainly because I didn’t think the job sounded cool enough – OK, to be a nerd was bad enough but to get a job “as a nerd”… well, you see my point. The trainee will be given the opportunity to learn about the commercial application of the McDonnell Douglas Reality based family of computers. In return, the trainee will be expected to contribute to the commercial activities of the Company mainly through the application of computer programming skills. Unfortunately their definition of “contribute to the commercial activities of the Company” differed greatly from mine and the corporate suit thing turned out to be something I really hated. Fortunately, as a trainee programmer, the expected level of attainment was set pretty low. 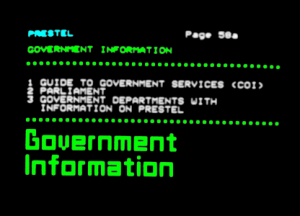 This allowed me to utilise my time in more productive ways, usually this meant playing around online – not “online” as we know it today, but rather exploring Viewdata systems like Prestel and surfing the FidoNet looking for BBS like GandalfBB. Needless to say the inevitable parting of the ways soon followed later that year. I returned to the ITec but this time as one of their trainers. I eventually moved back to London to explore an alternate career path, the web was still a few years away and the only computer I had was a dodgy Amstrad PC2086 …but… I had a modem! Read the next chapter in ptII.